Today I’m saluting my dad on his birthday! He was born on the 11th day of the 11th month, weighing in at 11 lbs. and 11 ounces. I kid you not! And he makes the best sour cream pound cake in the world. I promise! It’s a family favorite. My dad never cooked, much less baked, until he retired from working for the federal government. I doubt that he would have known where the silverware was stored, much less where the cake pans were tucked away. He didn’t have a clue. But once he retired, it’s as if he had found his true calling! He learned to bake great cakes, pies, and cobblers. He also learned how to make cornbread and iced tea – staples of the south! It’s a miracle! My grandsons live for Old Paw Paw’s cakes! Yep, that’s what they lovingly call him! 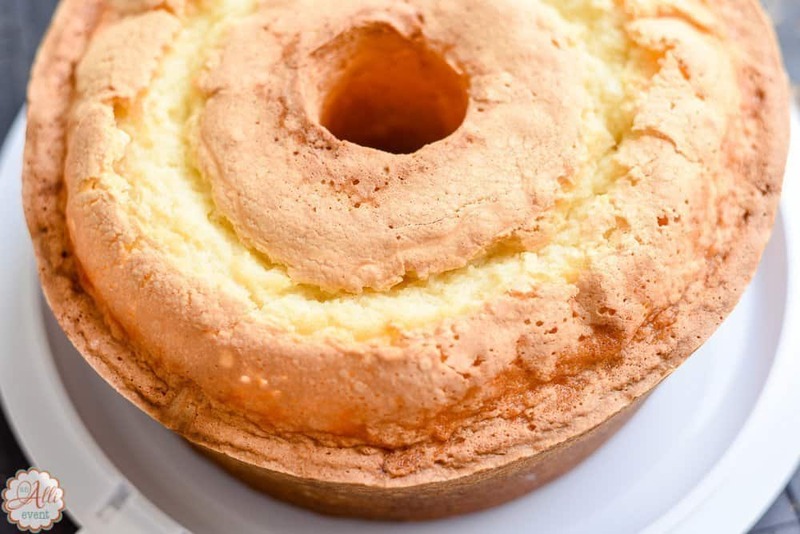 And if I’m visiting my parents and my grandkids aren’t along for the ride, dad always makes them a sour cream pound cake for me to take back to them. His sour cream pound cakes are so good that he’s actually been asked to sell them at a local farm stand type store! He politely declined. I’m sure dad doesn’t have the time to bake for that local farm stand because he still plants a garden, mows the grass in town and at the cabin, mends broken fences, deer hunts with my 80 year old mom (they each have a deer stand that is way high) and even climbs on the roof of the cabin to blow off the leaves! You can see their cabin here! As you can tell, I’m really proud of my dad. I could go on and on, but you get the gist. I love him and his sour cream pound cake. Try it and you’ll love it, too. 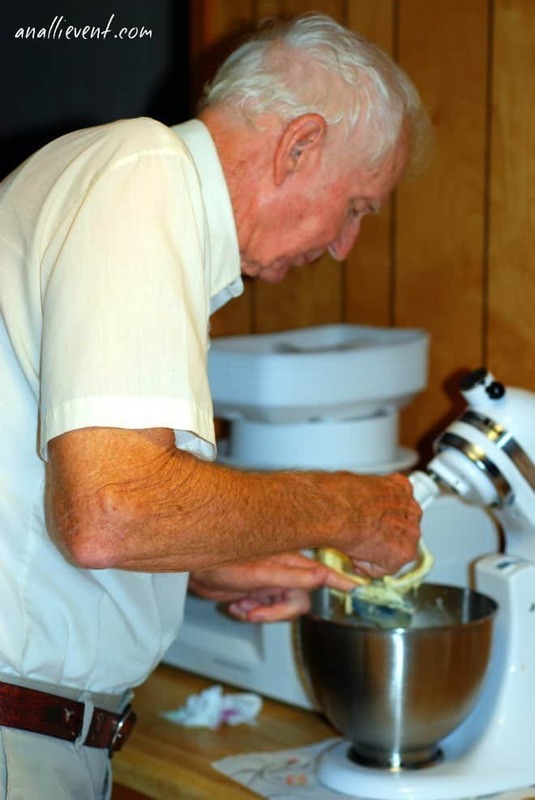 I’m so glad I caught dad in the act of making his sour cream pound cake. I’ll cherish these photos forever. Dad gets all his ingredients together before making the cake. He’s a smart man! He carefully cracks the eggs. Then mixes it all together with the trusty KitchenAid mixer. 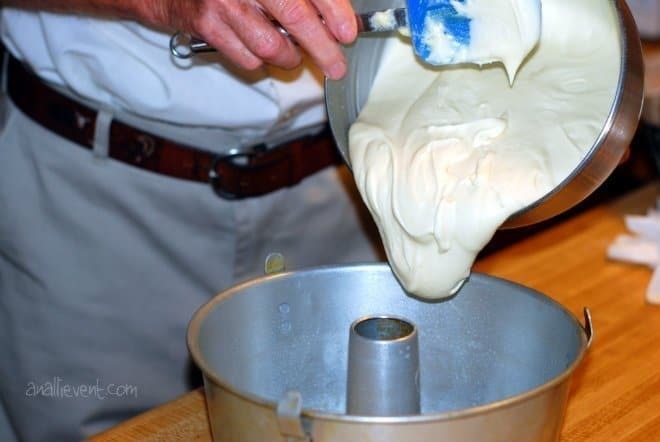 Look at that delicious batter. I would love to grab a spoon and enjoy a bite or two. 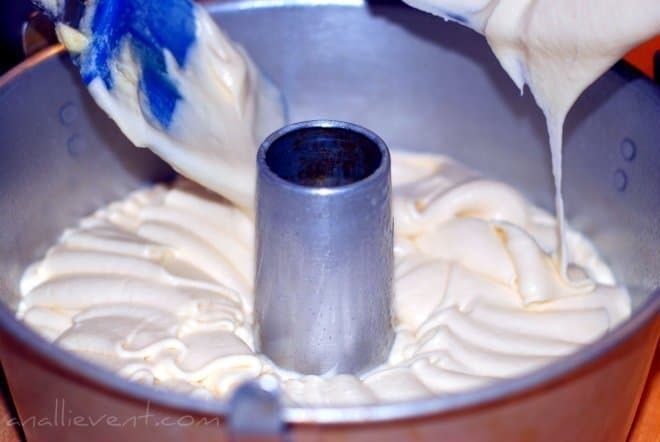 Pour the batter into a greased and floured tube pan. Dad uses the spray with the flour included to grease the pan. 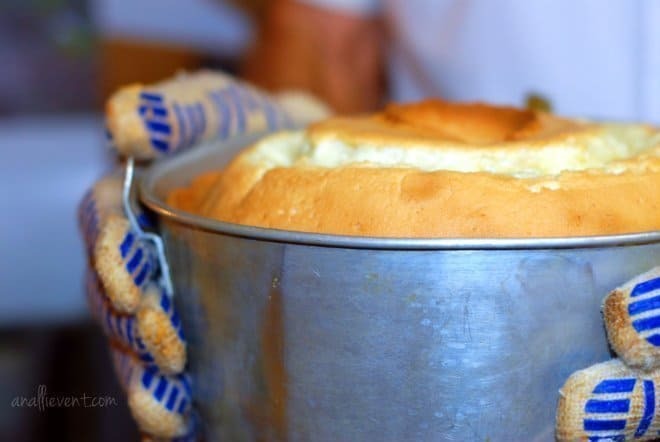 I grease my pan the old fashioned way – with Crisco and flour. Either way is fine. Helpful Hint: To get rid of excess air in the batter, tap the cake pan on the counter a few times before baking. Dad’s sour cream pound cake comes out perfect every single time. Preheat oven to 325º F. Grease and flour a 10-inch tube cake pan. Add soda and salt to sour cream and set aside. Cream butter well. Add sugar gradually, beating well after each addition. Add eggs one at a time and beat well after each. Add sour cream alternately with flour, beginning and ending with flour. Beat well after each addition. Add vanilla and mix on low until just combined. Bake at 325º for one hour and a half, checking with a toothpick after baking for one hour 15 minutes. Cool on wire rack for 10 minutes before removing from pan. Serve with lemon glaze if desired! Lemon Glaze (2 cups powdered sugar and 3-4 Tablespoons freshly squeezed lemon juice) Add powdered sugar to a medium-sized bowl. Add the lemon juice and whisk until smooth. The glaze should be thick but pourable. Add more lemon juice to thin it out or powdered sugar to thicken to the desired consistency. 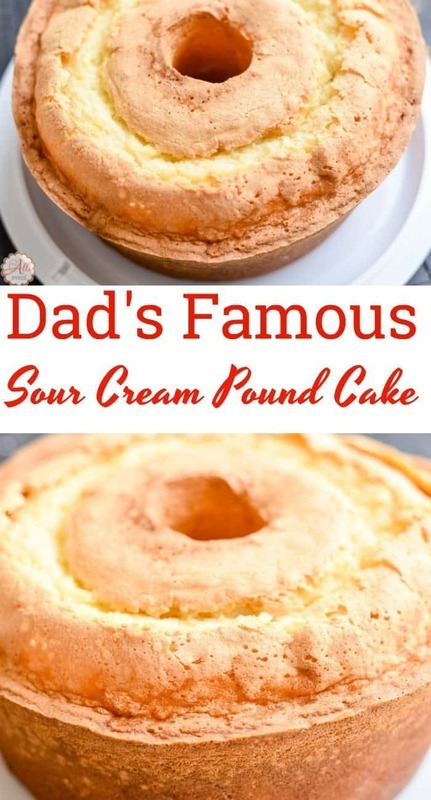 Dad’s Sour Cream Pound Cake is a fail-proof recipe (at least for him). Here are some tips to ensure your cake turns out perfectly. Measure accurately. (use dry measuring cups to measure dry ingredients) – Always spoon flour into the measuring cup and lightly level with a straight edge. 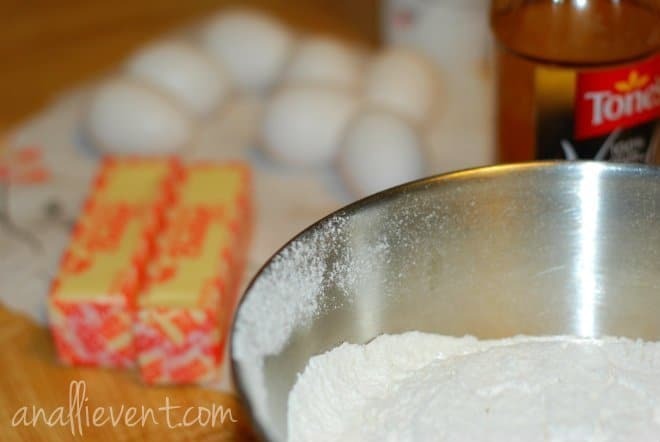 Extra flour can make a cake dry and extra sugar can cause a cake to fall. Don’t remove the baked cake from the pan too early or too late. Let the cake cool in the pan for 10 minutes. After removing the cake from the oven, place the cake pan on a wire rack. Keep away from drafts while cooling. Use the correct type of cake pan. 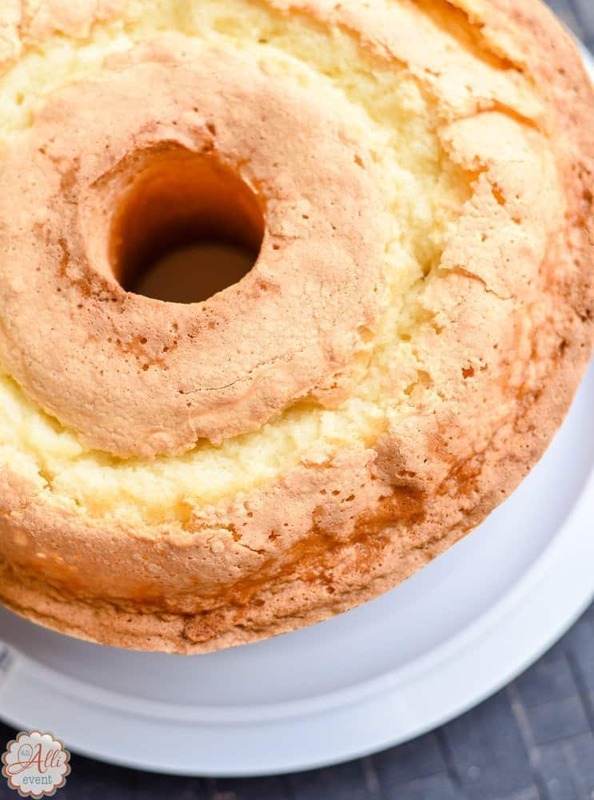 Tube pans and bundt pans don’t always hold the same amount of batter. I like dad’s Sour Cream Pound Cake just the way it is. But sometimes, I’ll jazz it up a bit. With a Lemon Glaze (2 cups powdered sugar and 3-4 Tablespoons freshly squeezed lemon juice) Add powdered sugar to a medium-sized bowl. Add the lemon juice and whisk until smooth. The glaze should be thick but pourable. Add more lemon juice to thin it out or powdered sugar to thicken to the desired consistency. Awww, what a sweet post, and it sounds DELICIOUS! The cake sounds delicious, happy birthday to your Dad and btw go grandma 11 pounds and 11 ounces WOW. Mine were all big babies but even my biggest was 10 pound 2!! I know, right! And I thought a 9 lb baby was a big one! Alli, what a wonderful post and happy birthday to your Dad! I absolutely love pound cake and this sounds fantastic. Thank you so much for sharing and have a happy Monday! Thanks, Cindy! I love pound cake, too. My grands like it even more than I do. Awww, what a sweet post! Happy birthday to your dad. 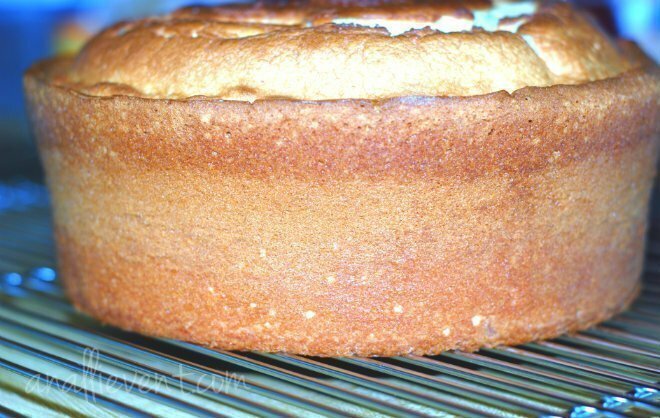 I look forward to trying this cake recipe and will think of you and your family! We celebrated his birthday back in October because it was the only weekend that we could all be there. I so enjoyed watching him bake and taking his pics. Isn’t family the greatest? And you are so right best cake in town. It’s making me hungry for one. 🙂 Happy Bday Dad. It’s so good for breakfast with a cup of coffee, isn’t it? Wish I had a piece right now! Happy birthday to your dad! My son was born on 11/11 as well. This recipe looks amazing. Thank you for sharing it and your dad with us as well. Happy Birthday to your son! I think my dad is amazing, but I’m a little biased. He sounds like an amazing man, and that cake looks FANTASTIC! Both are amazing to me! Rhondda Mol recently posted…Try Tunisian Crochet – CHECK! Thanks, Rhondda! We all love his cakes, especially this one. What a treat to celebrate the elevens and your Dad’s Sour Cream Pound Cake. My Dad liked to cook too and that makes for a very special bond. Happy Birthday to him and thanks for sharing is lovely cake with us. How awesome that your dad loves to cook, as well. I always enjoy sharing stories about my family. awww happy 80th birthday dad!! Awww, what a sweet post, love the pictures with your Dad making the cake! Happy birthday to your dad, you are blessed to have him. Happy birthday to Paw Paw!!! Yes, he does make the best pound cakes! I can’t wait to see them at Christmas. I miss them so much. Do try it! His always turns out fabulous. I really truly enjoy reading your website. I worked for 10 years with your sister, until I retired in January. My dad did a lot of baking also after he retired. I enjoyed reading 5 Hindrances to Prayer. Hi, Juanita! I feel like I know you! Melinda has talked about you so much (all good things, of course). I feel like I already know you! And she told me you were back in town. I’m so glad you read my blog. Thanks for taking the time to comment. The eleven thing is really weird. I can’t imagine giving birth to a child that weighed that much! As I read this I was looking over at the pound cake he made all for me for my birthday this past Saturday. I know, I’m special too! Thanks bro, your the best, and I love you and Helen. Hi Alli! Happy Birthday to your dad! That poundcake looks scrumptious! 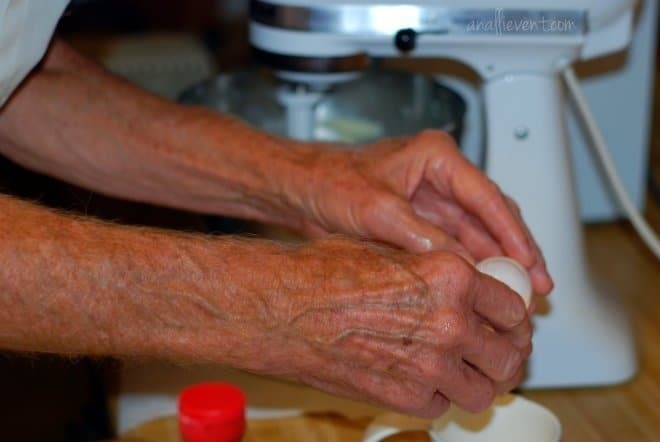 Do you know how long I have waited for that delicious pound cake recipe?? He DOES make the best pound cake in the world!!! I know you love his pound cakes, Kelli. Well, now you have the recipe. It looks pretty simple to me. I do know that it’s a really old recipe. This looks so easy and delicious! I look forward to trying it. Looks like you and your father enjoy cooking together. Thanks for sharing! Your post made me miss my father. My father’s story was similar. Didn’t even know where the kitchen was located until after he retired. He loved buying all sorts of spices though many he never used. It is great that your kids will have wonderful memories of him and his treats. I’m trying to enjoy my mom and dad as much as I can. I just wished I lived closer (6 driving hours away). Like you, I will always have the memories. I think it’s awesome how your dad loved all the spices!